I love decorating for Christmas, it is something I look forward to every year. 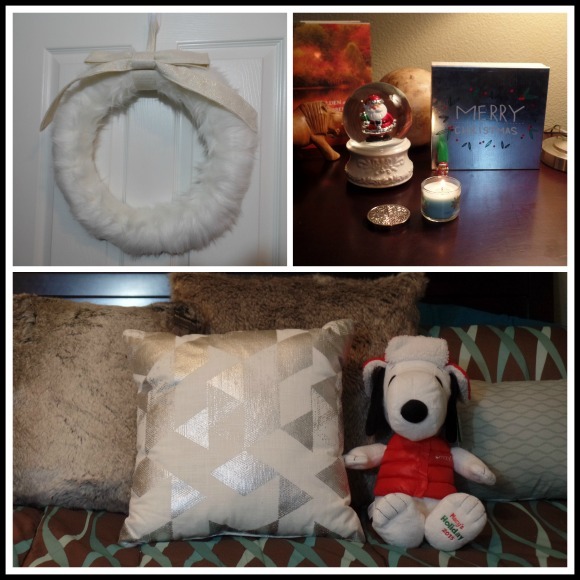 This year I decided to update a lot of my decor, and I was excited to plan out some new decor ideas, update some of my old favorites, and this year I even decided to decorate my bedroom. 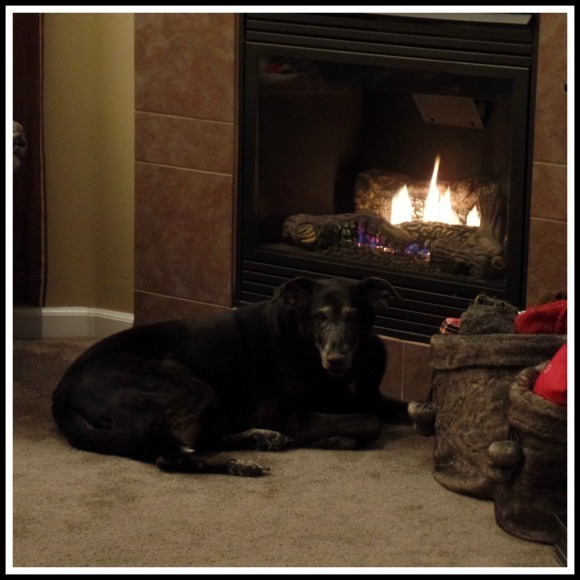 Here is a look at how I decorated for Christmas this year. I have really been drawn to all things metallic this year, so I decided to do my entry and dining room in gold and mixed metallic colors. 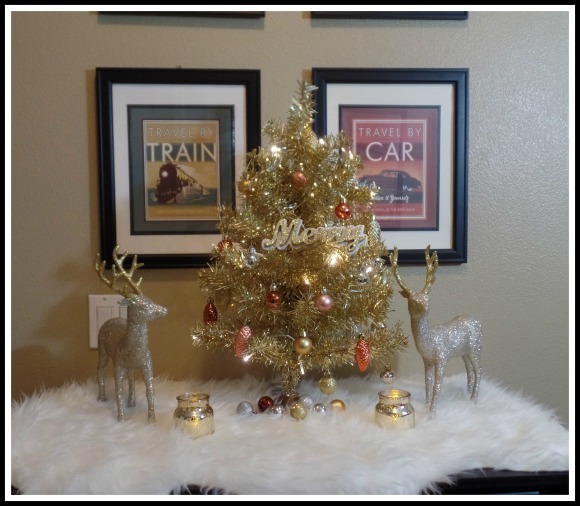 I love my little gold tree that I decorated with tiny metallic baubles and pinecones. 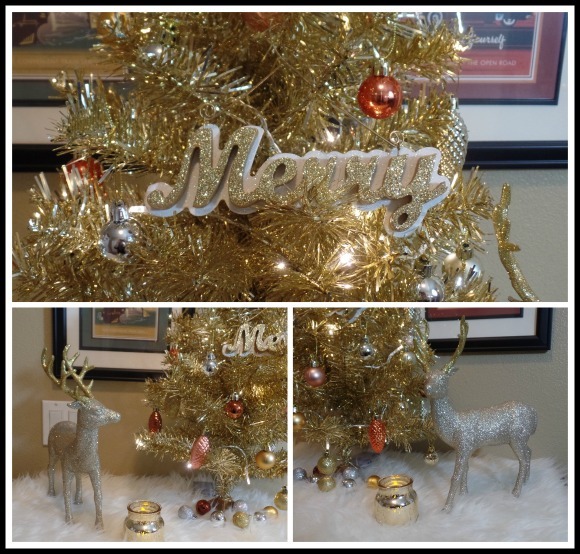 I flanked the tree with two glittery deer and added some gold mercury glass votives. I decided to soften the room with a faux lamb skin from Ikea. Here is the entry tree close up, I found a cute glittery cutout "Merry" ornament that made the perfect addition to the tree. The garage and coat closet doors each got wreaths. I love the simple green felt wreath, I added a sparkly Noel ornament to tie it in with the metallic look of the room. 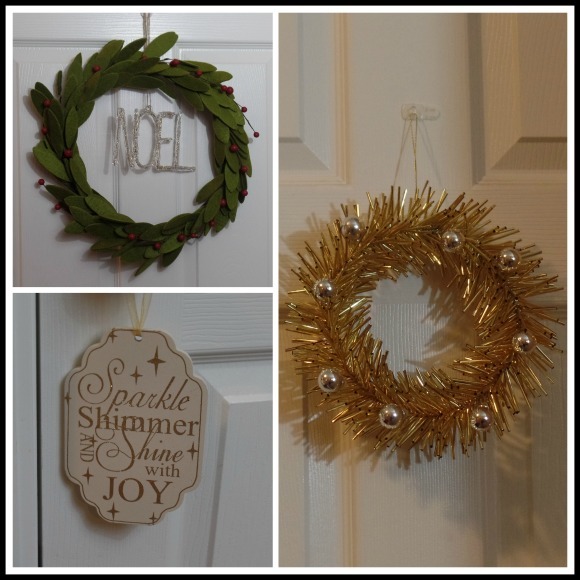 I found a tiny gold wreath for the garage door, as well as a cute little sign for the door handle. The entry opens up into the dining room, which is also done largely in metallic colors. 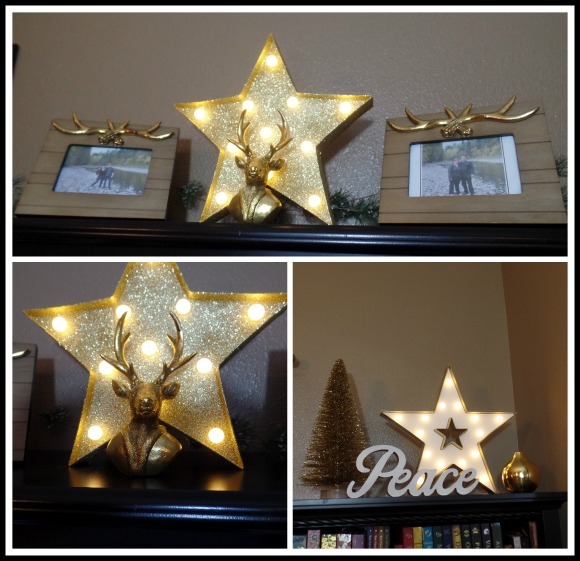 I found these cute picture frames with gold antlers as well as a great marquee style glitter star and a deer bust. I added pictures of our fall picnic to the frames. On top of another bookcase is another marquee style lighted star, with a beautiful gold bottle brush tree and a wood cutout Peace decoration. 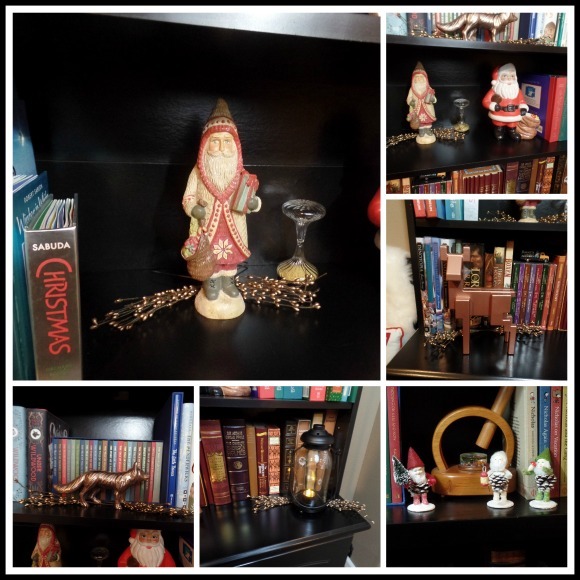 On my hutch bookcase I got out some of my favorite Christmas books and added some of my Santas, as well as a copper colored geometric shaped deer from Ikea, and a copper wolf from Target. I tucked in a few other favorite little decorations like my little pinecone elves around my books. My dining room doubles as my library, so I have a lot of bookcases that I can decorate. 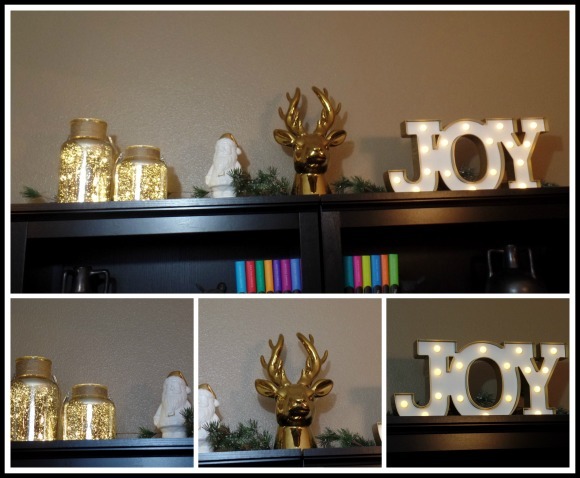 On one set of bookcases I displayed one of my favorite finds this year, my gold deer head from Target, along with mercury glass hurricanes filled with led twinkle lights, a white and gold Santa, and a marquee Joy sign, with some pine garland to soften all the metallics. 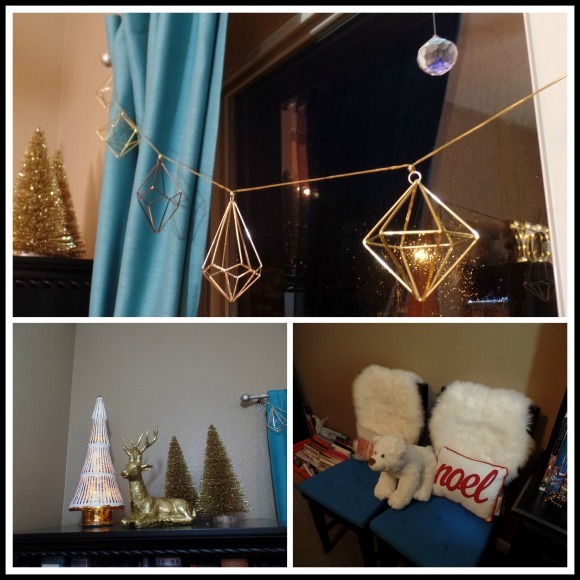 I strung a metallic geometric garland across the window, and the last bookcase is decorated with a gold foiled deer, a glass lighted white and copper tree and two gold bottle brush trees. I added some mini pillows to my chairs as well as my plush polar bear. On the table I have a cute sparkle themed wooden sign as well as my fox handled wooden tray with my gumdrop tree and some cute plates featuring animals dressed dapper style with gold accents, as well as a tall gold deer with a fur collar. 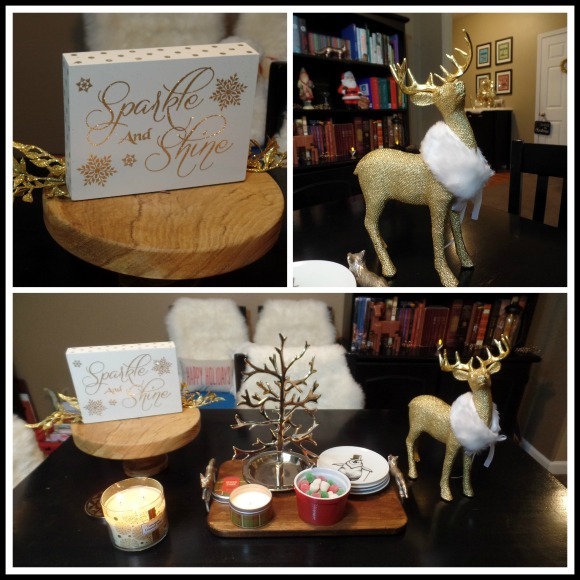 The side table is decorated with a burlap runner, gold deer, and other gold decor and floral picks, and features my two nativity scenes, my Celtic nativity and my olive wood nativity. 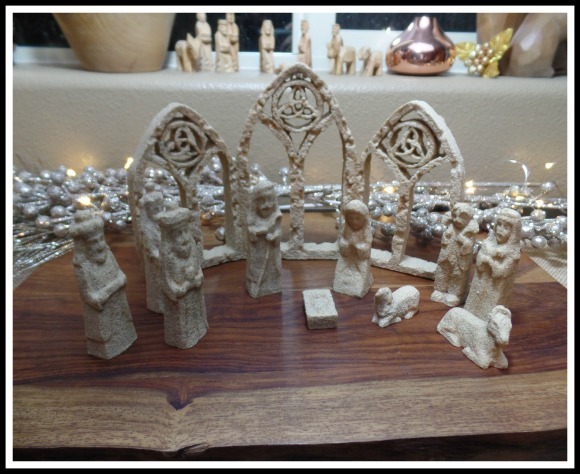 I love my Celtic nativity scene and look forward to having it out every Christmas, I love its simplified beauty. 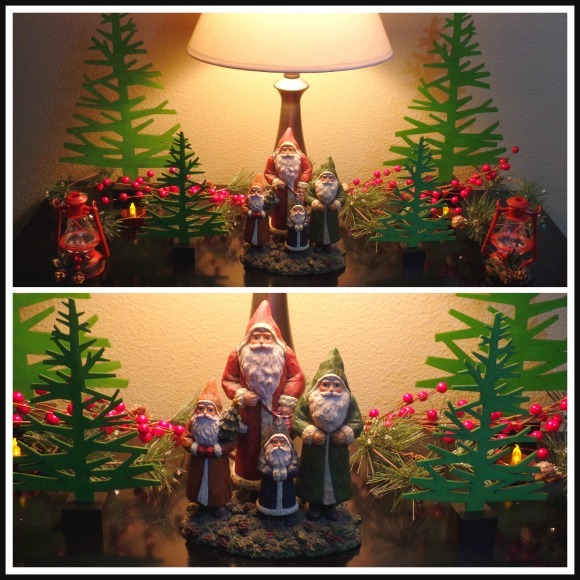 On the way to the living room is our little hallway table, this year I decorated it with laser cut flat trees from The Container Store surrounding my little group of Santas, along with little red lantern ornaments. 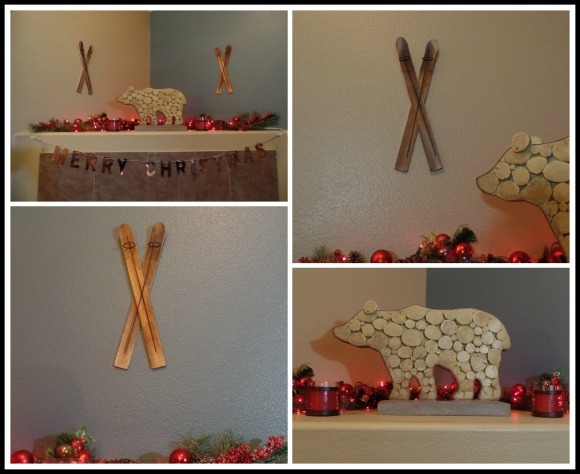 The living room is decorated in woodland and lodge themed decor with red and green as well as wood and faux fur accents. I found a new centerpiece for the mantle, a wonderful wood slice bear rimmed in rustic metal, I fell in love with this bear as soon as I saw it, both me and my hubby agreed it would be perfect. We kept with our tradition pine garland with red lights and red glass ornaments, and added some red candles in metal lined candle holders. To add height to the display I found these cute little wooden skis in Target's dollar spot, and they were perfect. I had originally purchase only one set of skis and they were on my TV stand as you can see above. Then I held it up to the wall and thought how nice it would look on the wall if I only had two. My Target's dollar spot gets picked over fast, so I wasn't very confident I would find any more of the skis since Black Friday had come and gone. However when I was out shopping with my mother, I popped over to Target and they had exactly two left, I was so happy to have found them. 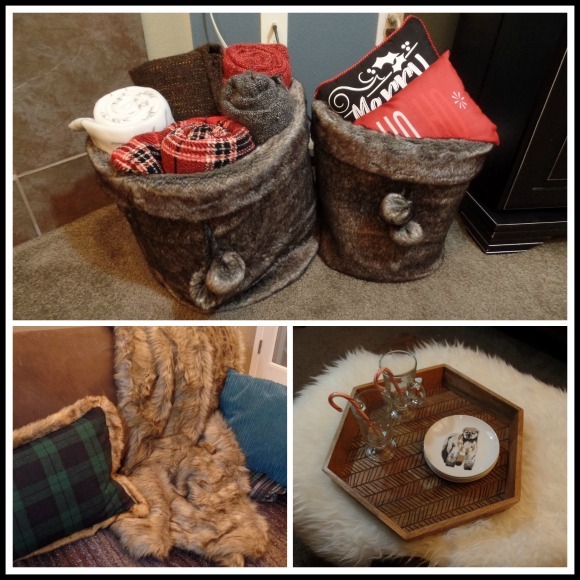 I found some cute fur buckets to store extra blankets and pillows, I found a very comfy faux fur throw, as well as a plaid fur lined pillow. I want to have many cozy evenings enjoying Christmas movies along with hot cocoa, so I found a sturdy wooden tray that I thought would be perfect for serving hot cocoa and snacks. I love how cozy our living room turned out. I am currently in the process of decorating our tree which we cut down this past weekend, I will be doing a separate post of our tree when it is finished as well as some pretty pictures of the tree farm we visited. 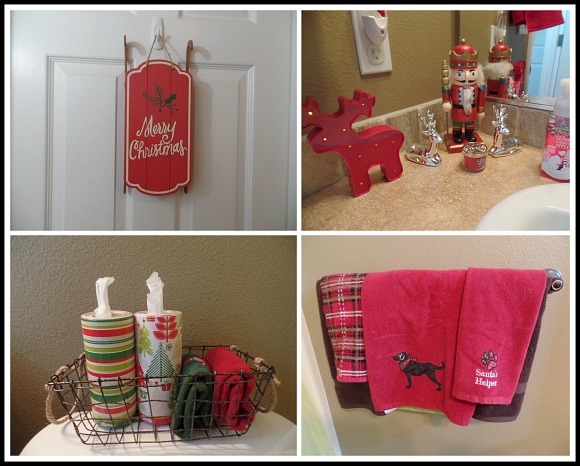 I always like to add Christmas decor to the main bathroom. I wanted to do classic red decorations, I displayed one of my nutcrackers with some of my little silver deer, as well as a cute whimsical light up reindeer. I set out Christmas towels, and Christmas tissue in a cute metal basket. For the bathroom door, I found a cute red sled with vintage lettering. 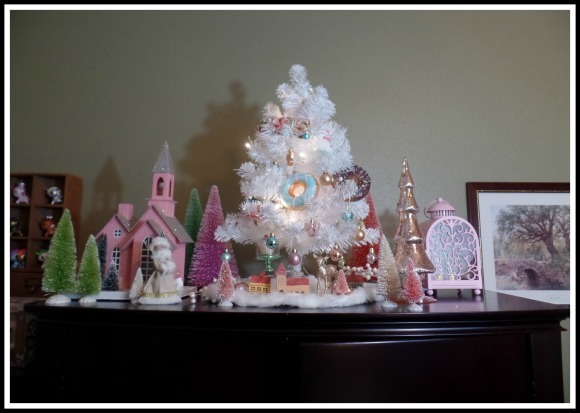 On our TV cabinet I set up a pretty pastel Christmas scene. 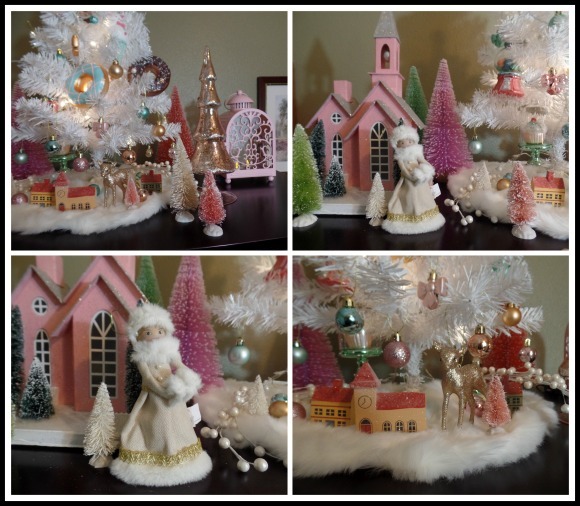 I used my old pink paperboard church, lots of pastel bottle brush trees, a pink mercury glass tree, and a wonderful collection of glass dessert themed pastel colored decorations that I found at Macy's this year and fell in love with. 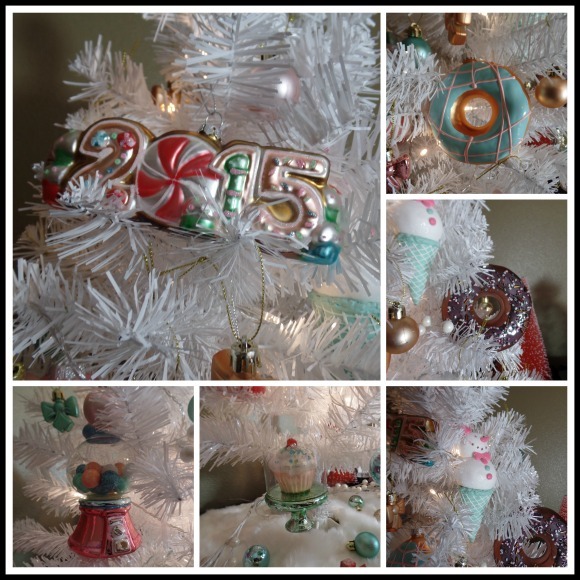 I love doughnuts and two of the ornaments are beautiful glass doughnuts, as well as a gumball machine, a cupcake in a glass domed stand, a cute snowman ice cream cone and a 2015 candy and sweets themed ornament. I also added some inexpensive mini pastel baubles. 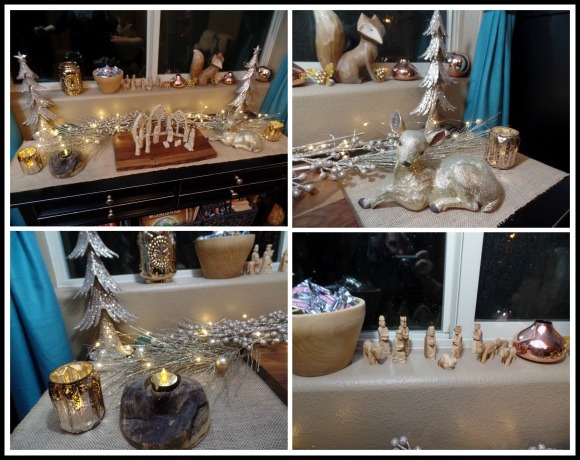 I found a pretty doll ornament wearing a cream colored winter outfit that I thought would be perfect for my display, I also added a glittery little deer and some of my old glittered mini wooden houses. I also found a pink metal candle holder from IKEA (I have the same one in red in my living room), and I knew the pink one would be perfect for my pastel Christmas display. I love how it turned out, and it makes me happy every time I see it from our bed. 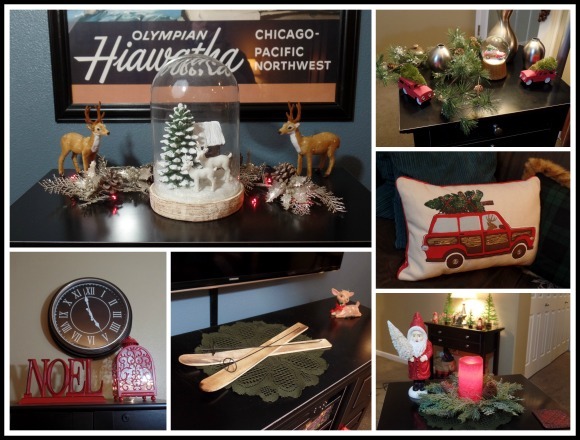 So that is our Christmas home, I had so much fun updating my decor this year. I also made a video of our Christmas Home Tour for my Youtube channel which you can view below. Thanks for stopping by, I hope everyone is having a nice holiday season! Everything looks so merry and bright, April! You did a great job with your video. Love the woodland theme especially. Pretty Nativity set. It's hard to find a pretty one. Have a happy mid-December!